Rockingham Ranch and Gelfenstein Farm’s X Y Jet breezed five-furlongs from the starting gate in 59.60 seconds at Monmouth Park Saturday in preparation for a scheduled start in the $250,000 Smile Sprint (G3) on next Saturday’s Summit of Speed program at Gulfstream Park. The gray son of Kantharos, who turned in the fastest of 11 clockings at the distance, is set to make his first start in the six-furlong Smile since finishing second, a head behind victorious Mind Your Biscuits, in the $2 million Dubai Golden Shaheen (G1) March 31. Emisael Jaramillo will have the return mount aboard the Florida-bred gelding. X Y Jet is scheduled to fly to South Florida Tuesday and will be stabled in trainer Juan Arias’ barn at Gulfstream Park West. 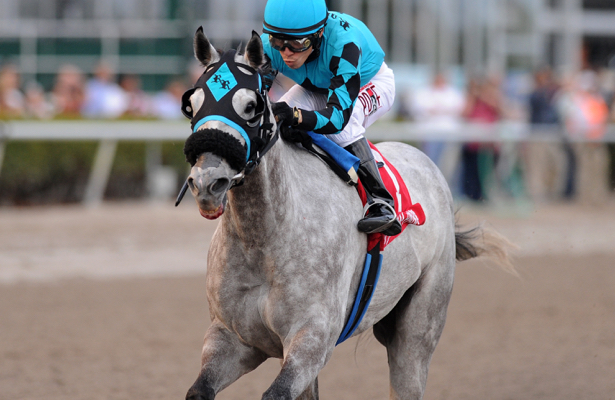 X Y Jet has won his last five starts at Gulfstream, where he captured the Mr. Prospector (G3) and Sunshine Millions Sprint during the Championship Meet. He won the Mr. Prospector, the Sunshine Millions Sprint and the Gulfstream Park Sprint (G3) during the 2015-2016 Championship Meet to tune up for the Dubai Golden Shaheen, in which he finished second, a neck behind Muarrab. Gulfstream Park-based Classic Rock breezed a half mile in 45.77 seconds Saturday morning for the Smile, in which the Kathy Ritvo-trained 4-year-old is scheduled to seek his fourth straight victory and seventh win in eight starts at Gulfstream. The clocking was the fastest of 95 recorded at the distance. Owned by Reeves Thoroughbred Racing, the son of Maclean’s Music won the March 3 Gulfstream Park Sprint (G3) and the May 6 Jeblar Stakes in his two most recent starts. At Churchill Downs, Roy Gene Evans’ Chief Cicatriz breezed a half mile in 48.20 seconds Saturday morning for a scheduled start in the Smile. The Shawn Davis-trained 5-year-old gelding turned in the ninth fastest clocking of 99 recorded at the distance. The son of Munnings, who is scheduled to fly to South Florida Wednesday, captured the June 2 Aristides (G3) at Churchill Downs by 6 ½ lengths.